After hiking 24 miles to her shrine and memorial park in Mound City, many would give the same epithet to the Little Brothers and Sisters of the Community of the Lamb. 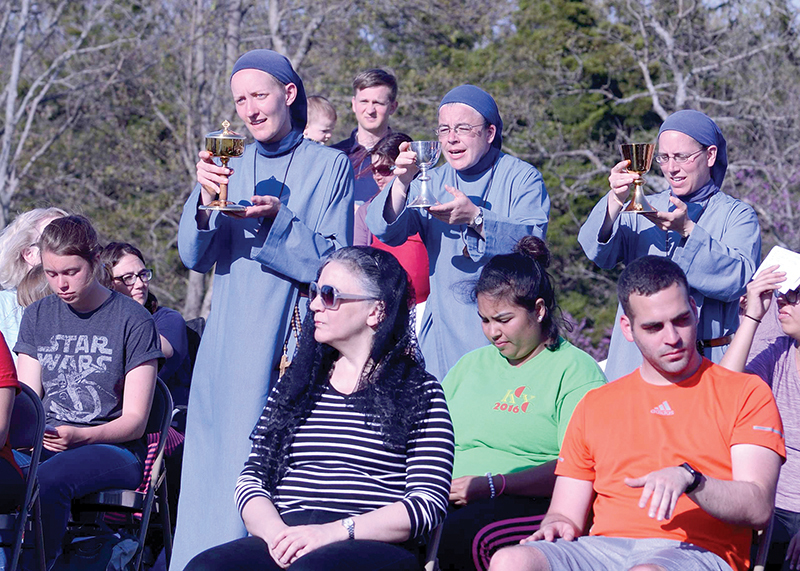 The community hosted the pilgrimage for young adults, leading them on a two-day journey of singing, prayer, adoration and sharing the Gospel. The walk ended with Mass and dinner in the park that commemorates the site of the Sugar Creek Mission where exiled Potawatomi made their home in 1837, and where St. Rose ministered to them. St. Rose is known as the first female saint west of the Mississippi River. She was a member of the Society of the Sacred Heart. In 1841, Jesuit priests invited the society to a new mission with the Potawatomi tribe. Sister Rose Philippine joined the group and, although her advanced age prevented her from undertaking traditional ministry, she was observed by the tribe members to be praying constantly. Though she was only with them for a year, the Potawatomi never forgot her. When the Community of the Lamb was invited to establish their order in the archdiocese 10 years ago, a Jesuit friend of the group, Father Joseph Carola, suggested they pray to St. Rose. Like them, she journeyed from France and came to this area to share God’s love with the poor. The community developed a great devotion to the saint and, in her honor, takes this yearly pilgrimage, inviting young adults to join them. When the pilgrims reached the park on Sunday, Little Brother Joachim gave a talk about St. Rose, emphasizing the perseverance of her faith through many misfortunes. “Ask the grace to be faithful to the Lord, especially when it is difficult,” he said. Beneath crosses inscribed with the names of more than 600 Catholic Potawatomi buried at the site, Little Brother Christophe celebrated Mass with Father Barry Clayton, pastor of Sacred Heart Parish in Mound City. “It is a great joy to be present today with all those who have done the walk — and their supporters who didn’t . . . but get the reward,” said Little Brother Christophe. . Indeed, many friends of the Community of the Lamb joined the pilgrims for Mass and dinner. In his homily, Little Brother Christophe emphasized the Gospel message of God’s love. “I can do nothing by myself,” he said. “If God does not look at me with his love, I just disappear into dust. He spoke to the hearts of the hungry and tired pilgrims when he told them only empty vessels can be filled with God’s grace. “The truth for us,” he said, “[is that] we are an empty glass and the more we are empty, then the more God can fill us. At the end of Mass, two young men, Jed and Jared, came forward to receive the crosses of the Community of the Lamb, becoming Young Adults of the Lamb. Other young adults were asked if they felt they might also be called to share in the mission of the community. Those who came forward were prayed over by the Community, and the words of Little Brother Christophe seemed to echo through that holy gesture. “St. Rose Philippine had moments that were truly failures,” he said during his homily. “But they were moments of purification, so the Lord could bear fruit in her life.